Please Vote for Me as Most Glamourous Startup! Yep, another competition! Please vote for me in this Startup Nation competition for home-based businesses. Thanks! Finally! My last new site improvement is now live. I've got a mini cart on my site, so you know when you have items in the cart and can view your items without ever leaving the item pages. 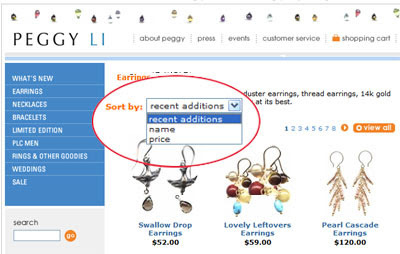 I hope this will help your handmade jewelry shopping experience on Peggyli.com. Let me know what you think! Peggy Li Creations Makes a Great Gift! Looking for that perfect gift for your friend, girlfriend, wife, mom? Look no further! Great gifts can be found at Peggy Li Creations handmade jewelry. From necklaces to earrings to rings, I have a wide selection of simple, classic, totally wearable designs at reasonable prices (find a gift for under $50!). 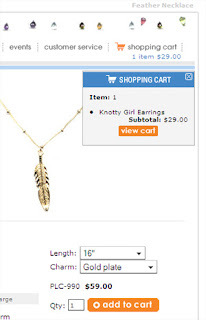 And now that you can sort my items by price, searching for that gift is easier than ever. Don't hesitate to contact me with any questions you may have -- I'm happy to tweak a design or give an opinion on what would make the best gift for any occasion. Gift boxes are available for $.75 each -- a 100% recycled cardboard gift box, printed with Peggy Li. Start by checking out What's New or my Best Seller's list. Can't find what you want? Send a Gift Certificate, available in $25, $50 and $100 denominations. 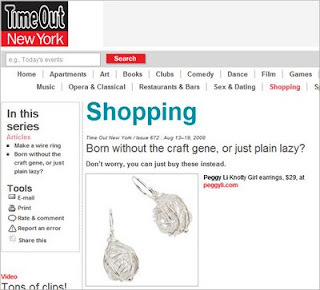 Latest Peggy Li Creations handmade jewelry makes an appearance in the Aug 13-19 issue of Time Out New York magazine. They are featuring my Knotty Girl earrings! I have been nominated as Best Jewelry Designer in an SFgate.com bAylist contest. 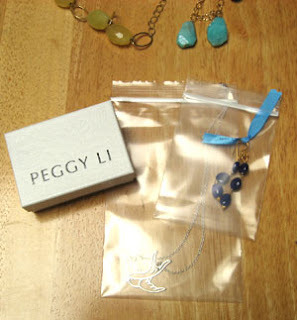 Please vote for Peggy Li Creations handmade jewelry as the best Bay Area jewelry designer! I'm very excited to announce updates to my handmade jewelry site, peggyli.com. 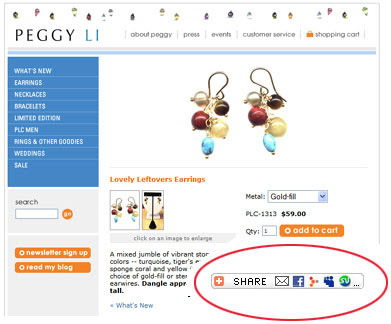 Post Peggy Li Creations items to your favorite social networking sites, including Facebook, Myspace, Kaboodle and more! Not into those sites? You can also email a page to a friend with this easy-to-use button. Now you can sort categories by Most Recent Additions, Name and PRICE (sorts lowest to highest)! Just click on the menu and highlight your choice. It's that simple! I'm always trying to improve the browsing and shopping experience for my users -- just send me an email at info@peggyli.com and let me know what you think! Two great blogs that feature tips and hints for brides have featured Peggy Li Creations! Check out With This Ring and Mrs. Designher! July is a busy time of year at Peggy Li Creations -- just a few months away from the busy fall wedding season! Brides with weddings in August and September have been sending in requests for custom bridesmaid jewelry as well as for jewelry for themselves. I've added new pictures to the Weddings Photos section of my site with pictures of brides and bridesmaids wearing their Peggy Li Creations handmade jewelry! Plus, check out new designs I've added to the Weddings section of peggyli.com. I often work with brides on custom work and will try my best to fit your budget! What's the best way to work on custom jewelry for your wedding? At least two months out, contact the designer. This gives enough time to order supplies and special items that may be needed. If you expect many revisions on what you want, give even more time! Let the designer know your budget per person, color scheme and other perferences (gold or silver? Pearls or no pearls?). Let them know the date you need all the items to arrive! Again, pad in some time if you think your bridal party may need ajustments. Two Bay Area Bead Stores Closed! I am sad to report that within a month of the closure of fave bead store Beadissimo in the Mission in San Francisco, I just got an email from The Bead Shop in Palo Alto announcing their closure after 26 years! Both of these shops have provided me with unique supplies, custom requests and classes that helped me grow my skills. The Bead Shop will continue online, and it appears like the classes from both shops will try and continue... I'll be staying tuned!